October | 2013 | ARTZCOOL'S BLOG! 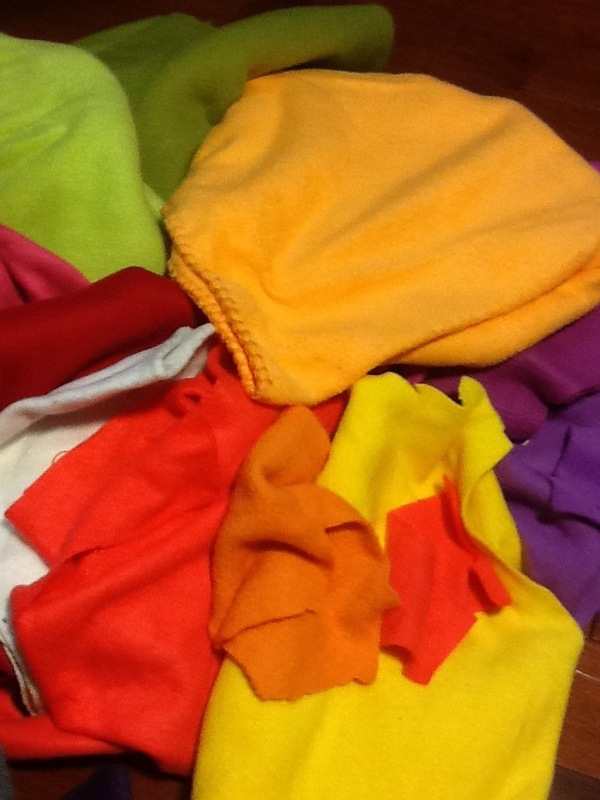 We went to Fabricland last week and we bought red, beige and brown polar fleece, and we also bought some tule for the skirt. 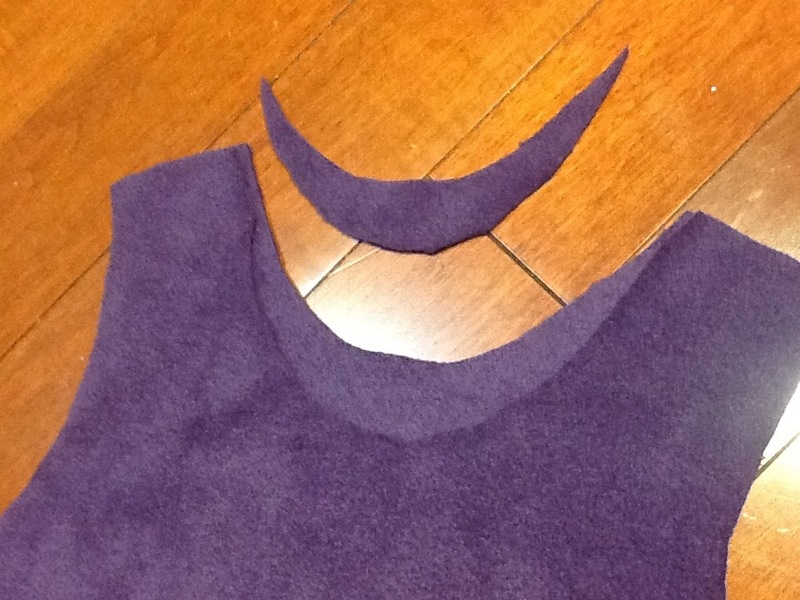 Then, I cut out the pattern and I pinned it and cut it out of the polar fleece. 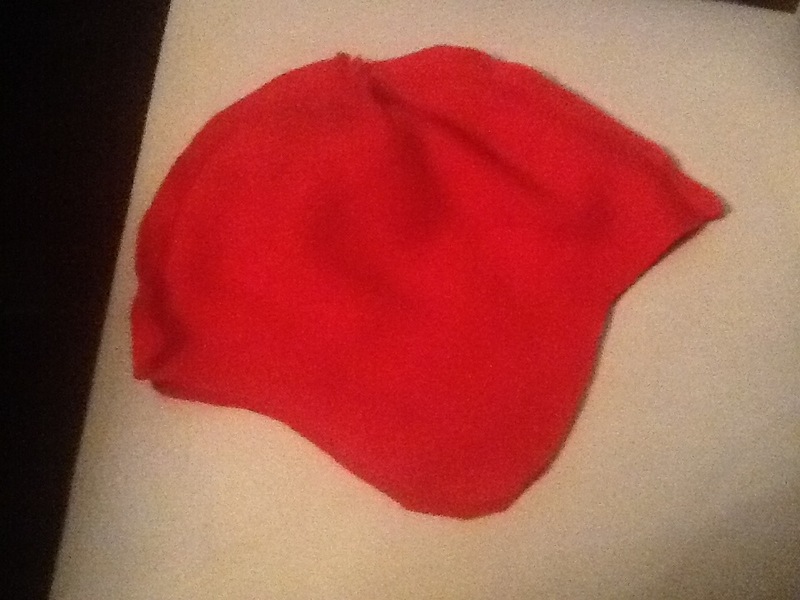 (I folded the polar fleece in half, to cut out two pieces) I decided to make the hat lined with red polar fleece, so I started with the lining. 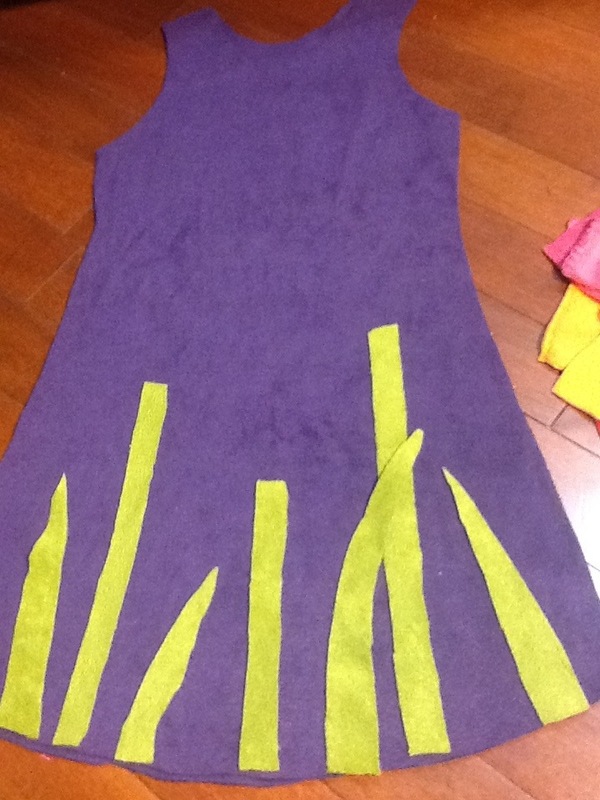 Then, I sewed the dart and around the sides to connect both pieces together. 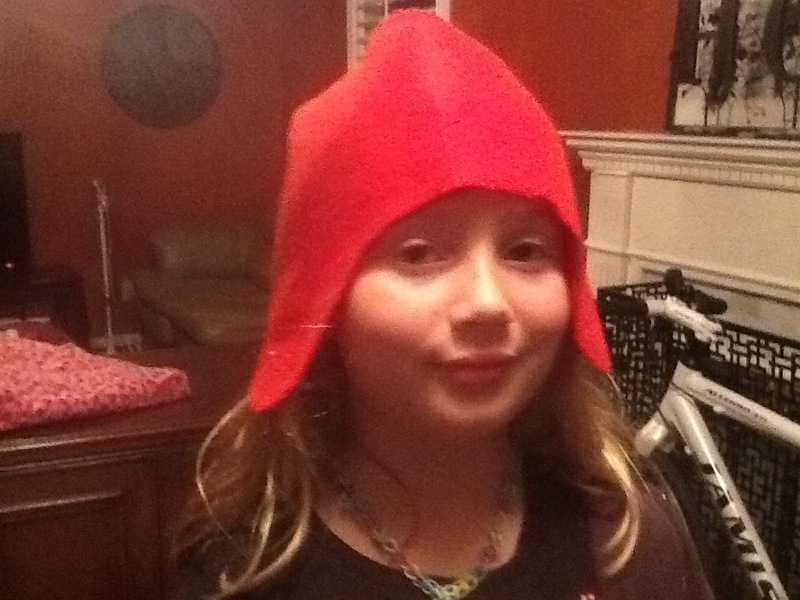 Then, Sam tried on the hat, and I made a couple adjustments to make it fit better. 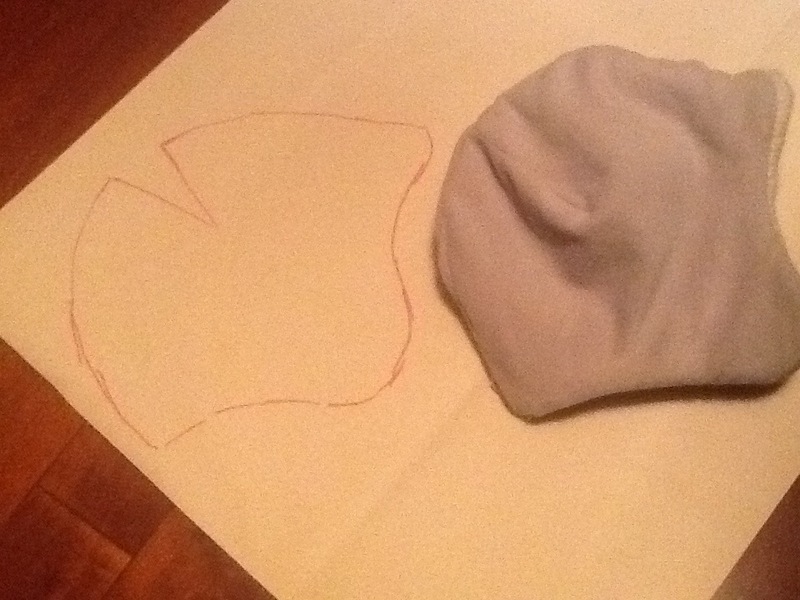 Once I was satisfied with the fit, I cut out another hat out of the darker fabric using the same, adjusted pattern. 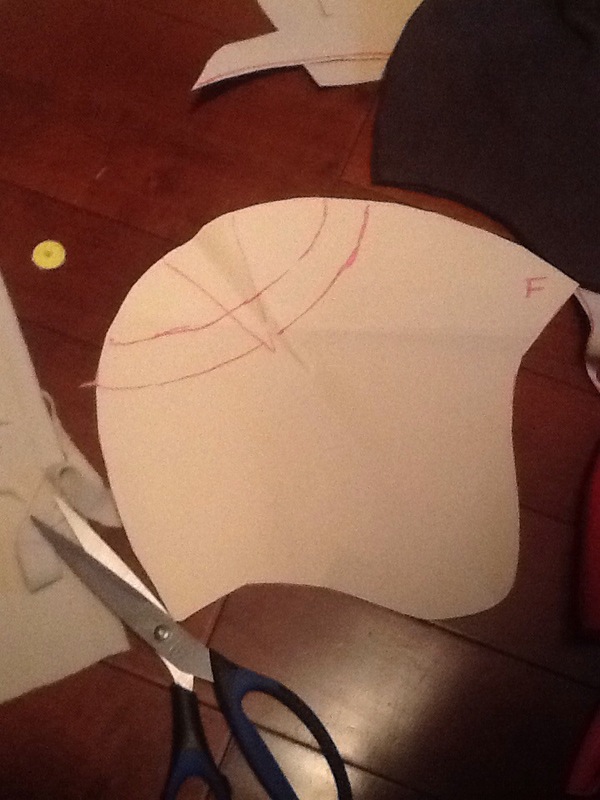 Then, I used the pattern to cut out a curved white stripe to become the monkey’s hat. 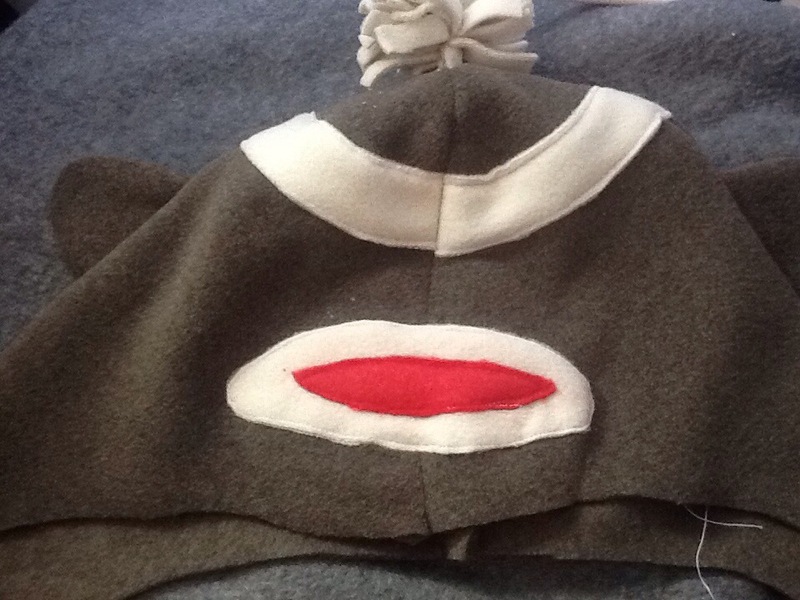 Before I sewed down the stripe, I roughly cut out a snout out of white and mouth out of the red. 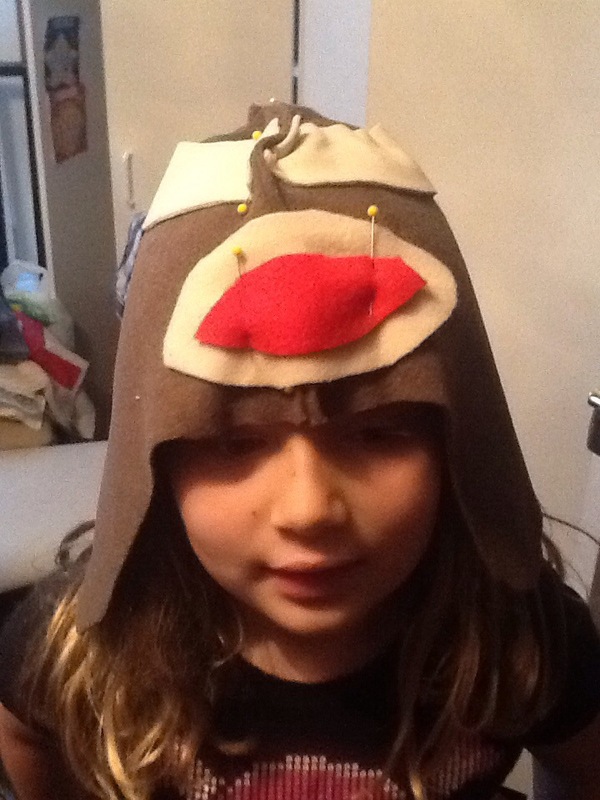 I pinned everything to the hat, then, she tried it on again. 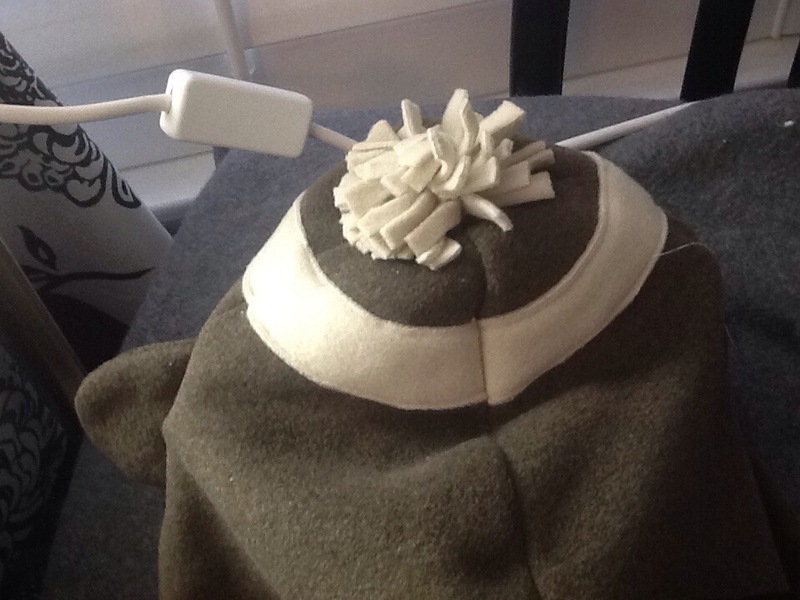 I wanted to make sure that everything was in the right place. 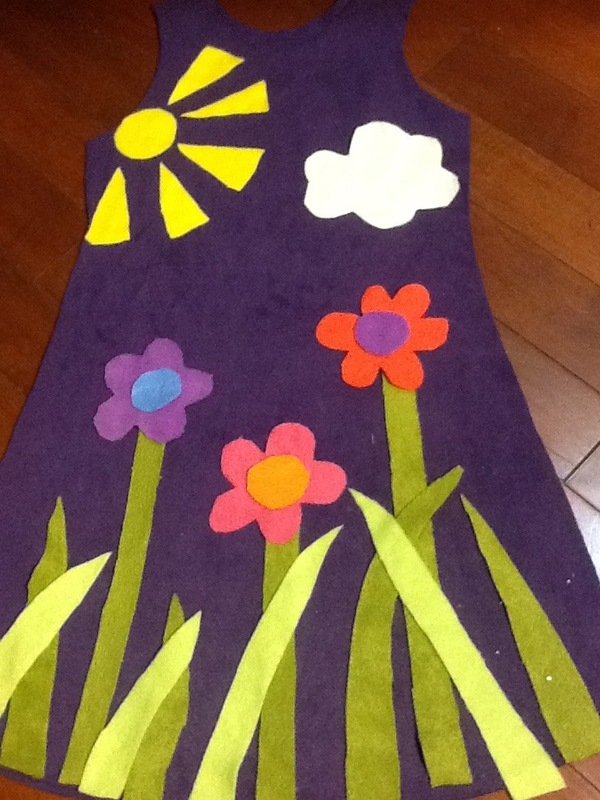 Then, I sewed the darts on the brown fabric, and sewed down the white stripes. 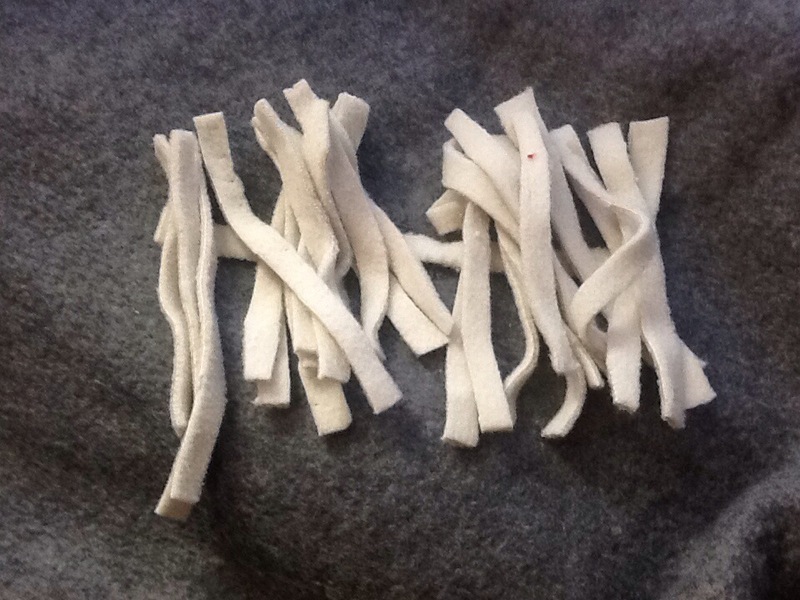 I trimmed off the white stripe, by using a sharp pair of scissors to clip near the seams. 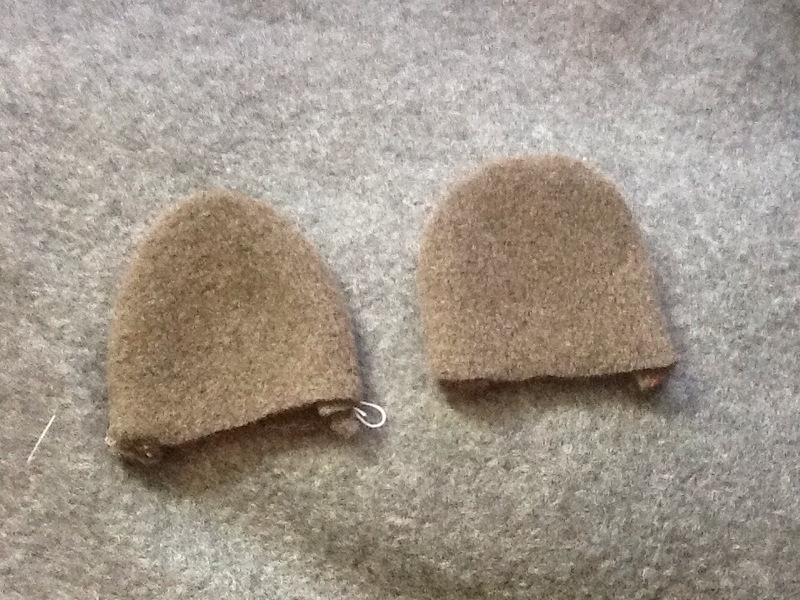 The problem was, I couldn’t figure out how to attach them…I decided the easiest way was to cut a slit at the end of the darts. 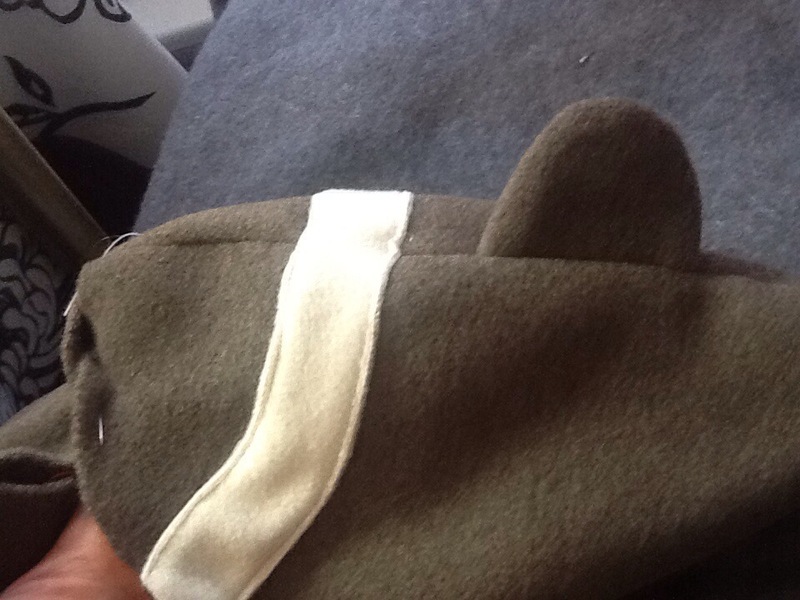 Next time I would make a slit in the pattern to accommodate the ears, but this seemed to work fine. 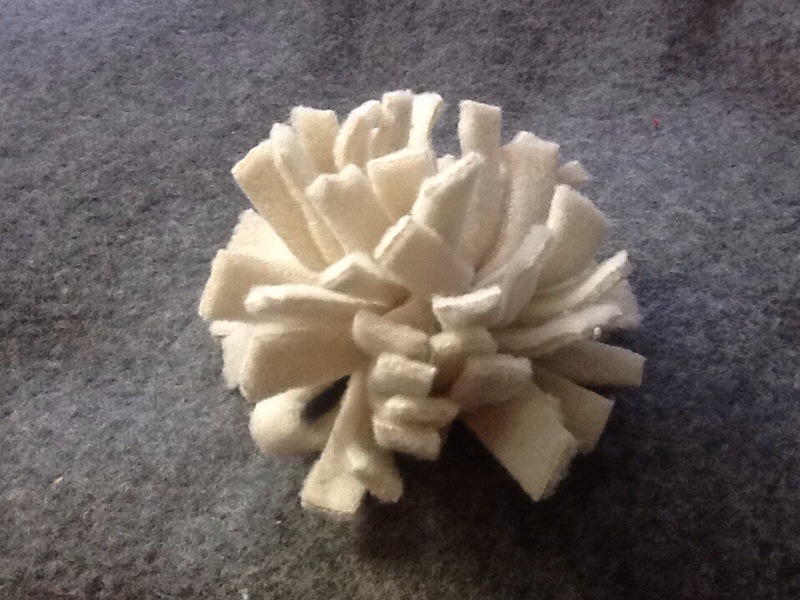 Next, I sewed around the center front and back, and I pinned the ties of the pom-pom to attach it at the very top…. 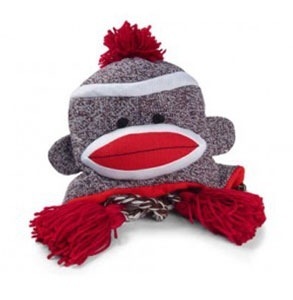 It’s starting to like like a monkey now! 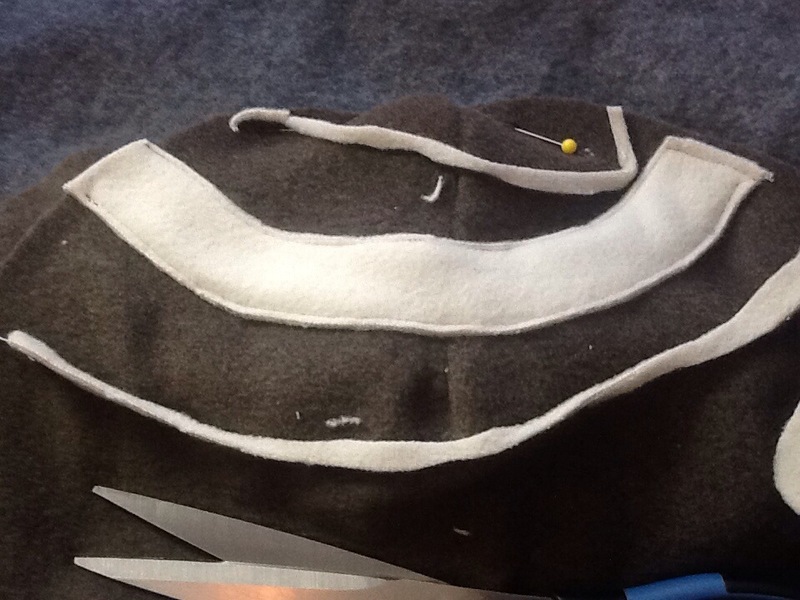 Next was the mouth, I pinned the mouth in place, sewed around the perimeter. 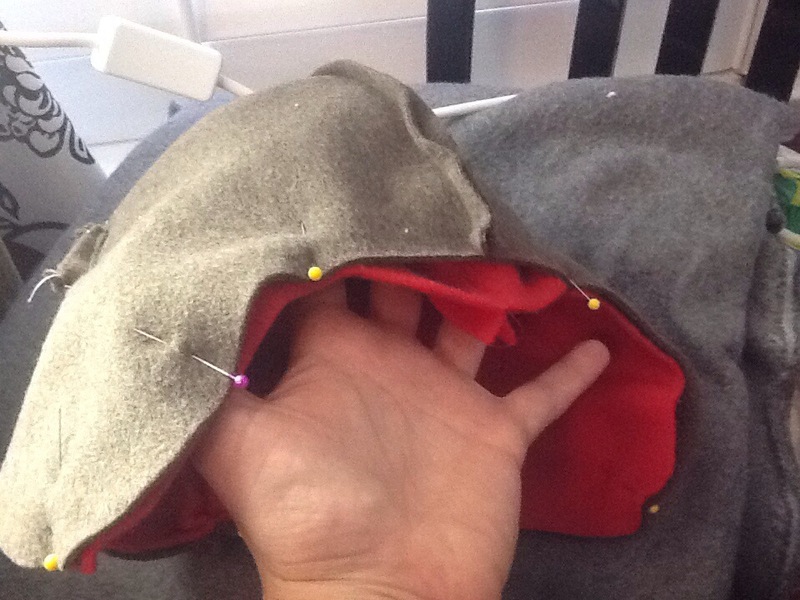 Be sure to leave space at the bottom for the seam. 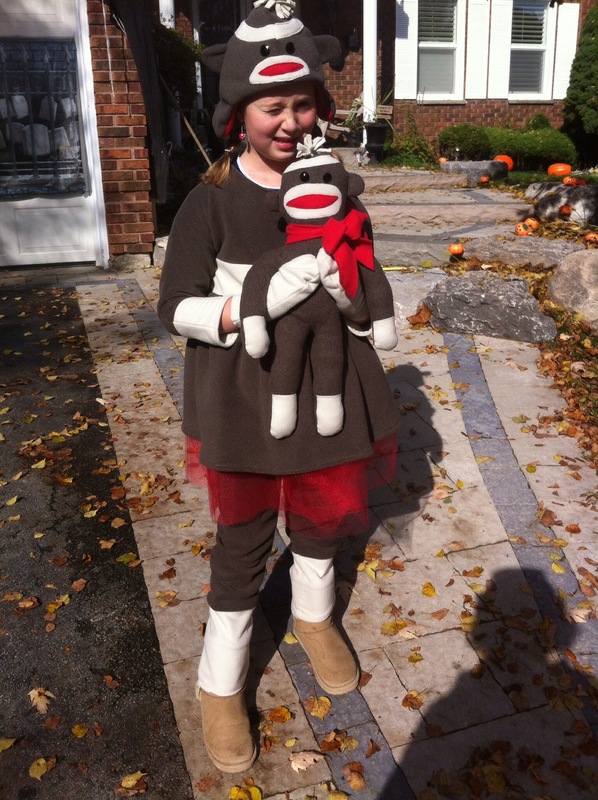 Now, I wish I could say that the costume was finished… but yesterday I made the hat, shirt, pants, skirt, and a matching monkey…yes, I know, the monkey wasn’t really necessary, but look how cute it is! So, I managed to get everything done in time to go trick-or-treating on Main Street yesterday afternoon. 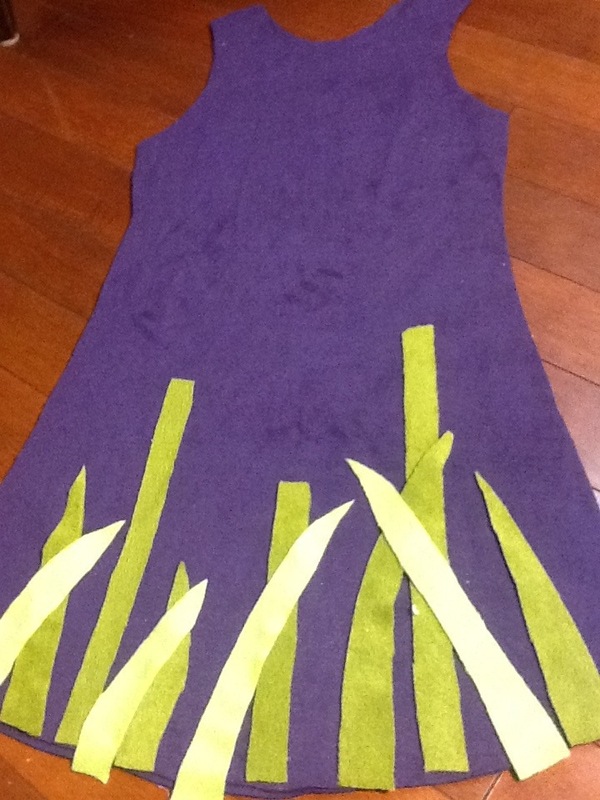 The bad news is I didn’t have time to blog about every piece as I made it…. sorry! 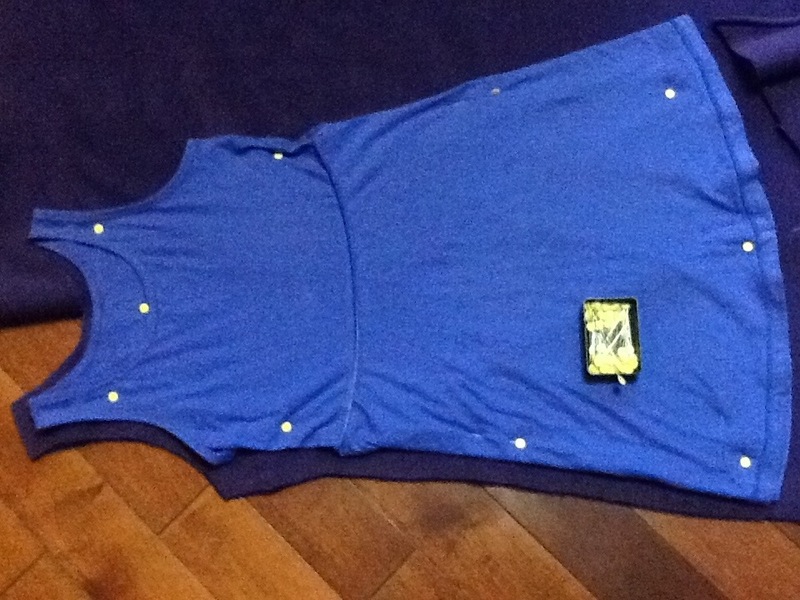 I will tell you that I used a pair of her pants, and a shirt the help make the patterns. 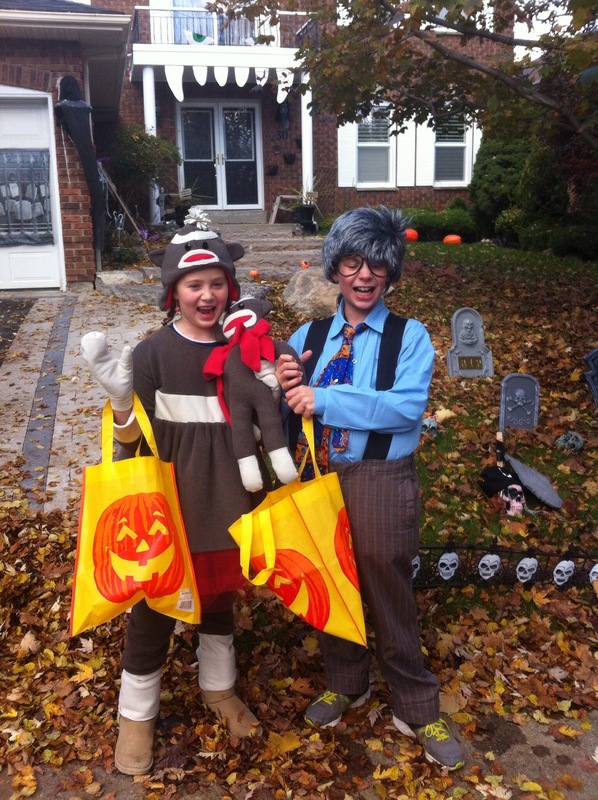 By the way, you like Dylan’s costume…he decided he wanted to be a grampa! 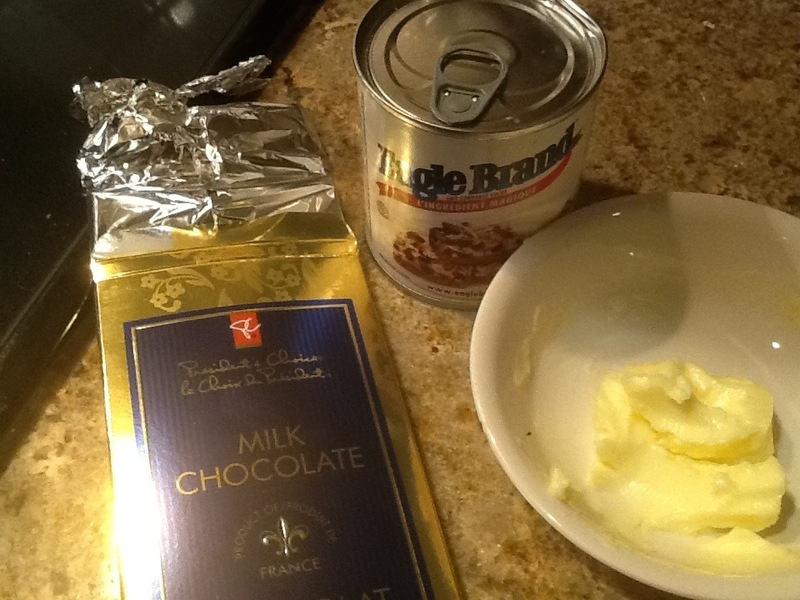 Anyways, for those of you poor unfortunate souls who don’t have a Chocolate Factory five minutes away, here’s a recipe. 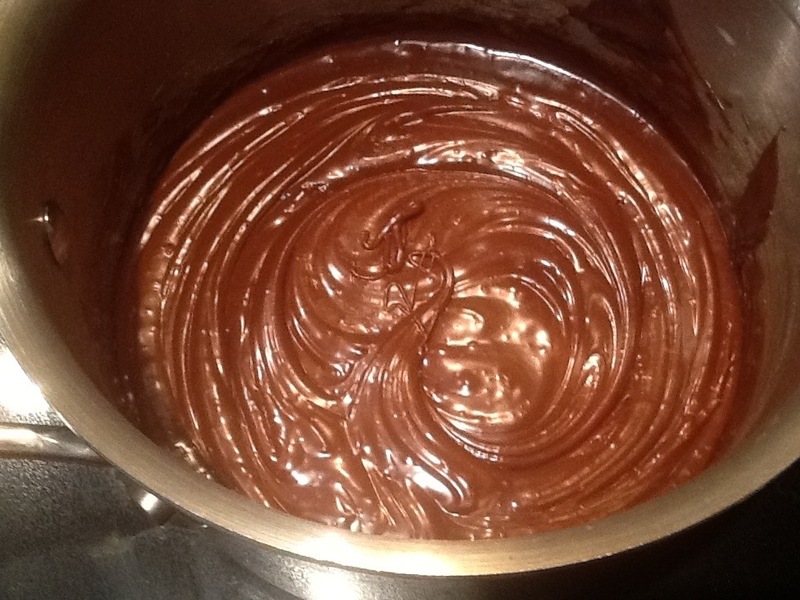 Dump everything in a pot and melt on low heat. 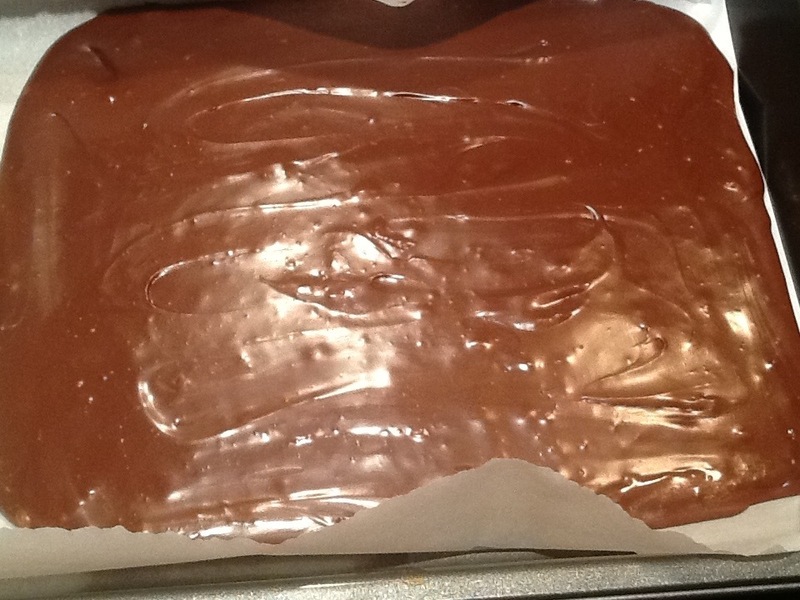 I ended up using a cup of milk chocolate pieces, and I added a cup of semisweet chocolate chips. I also added two tablespoons of butter. 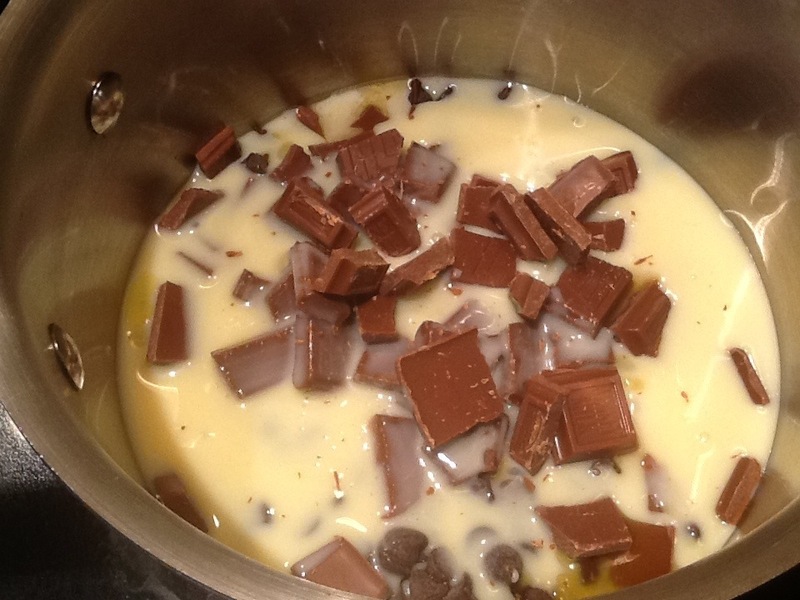 Then once you have mixed everything together, pour it into a pan…. 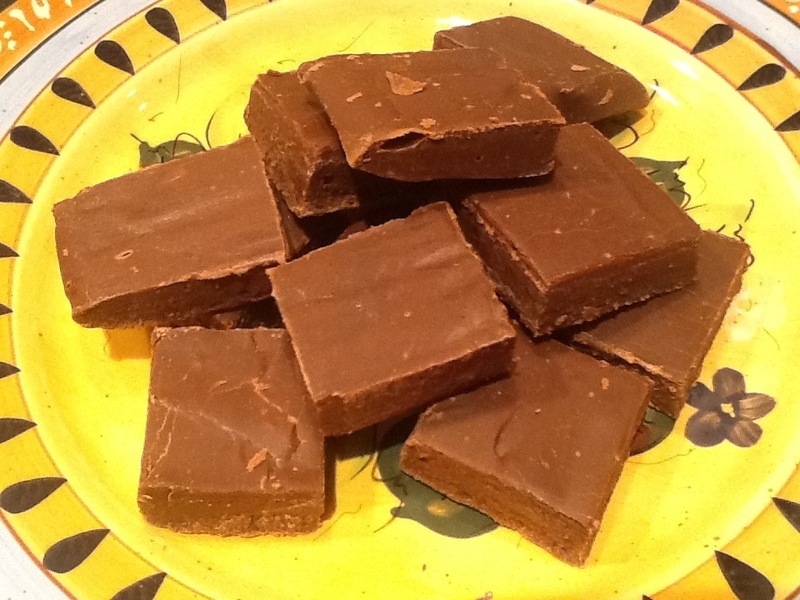 Now, here is the part I didn’t really think through before I made my decision not to get in the car to pick up fudge…you have to wait for it to harden! Dang. 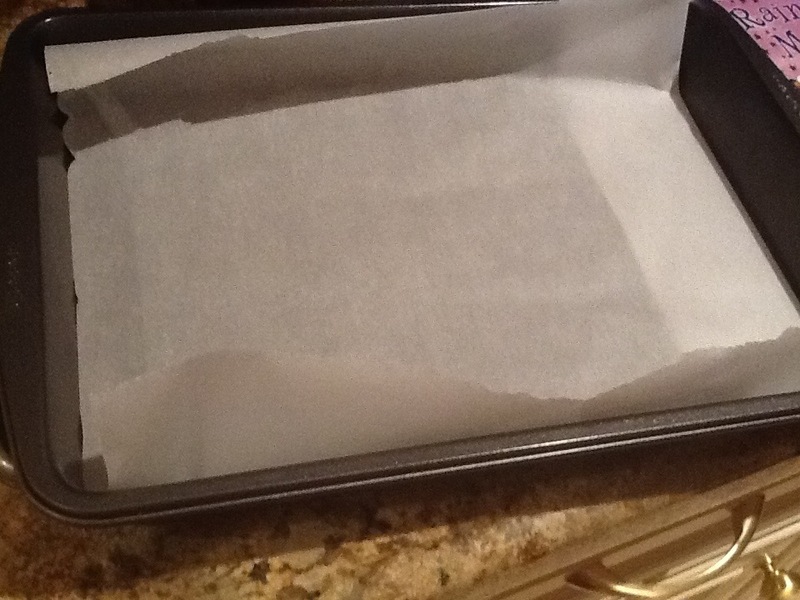 The recipe says 2 hours, but I can tell you now that 2 hours of cooling time didn’t happen. 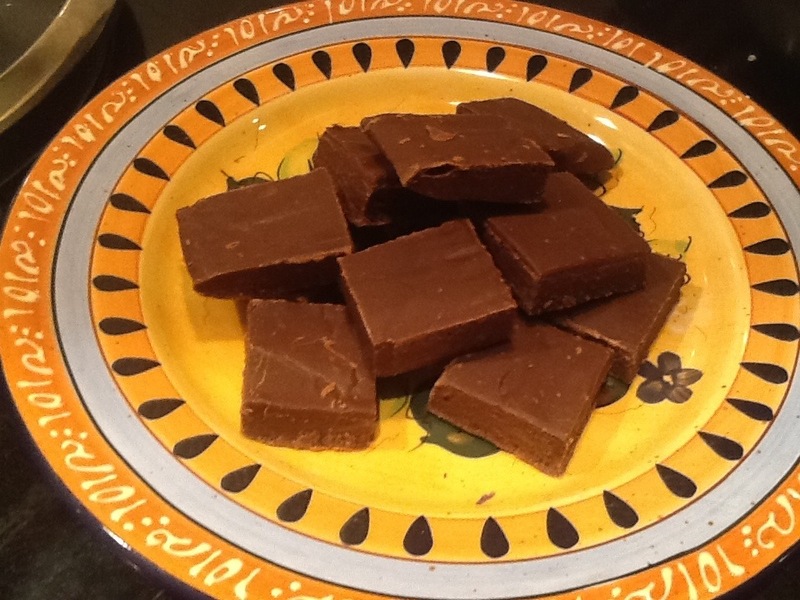 Its good to eat after an hour, even if it is a little gooey! 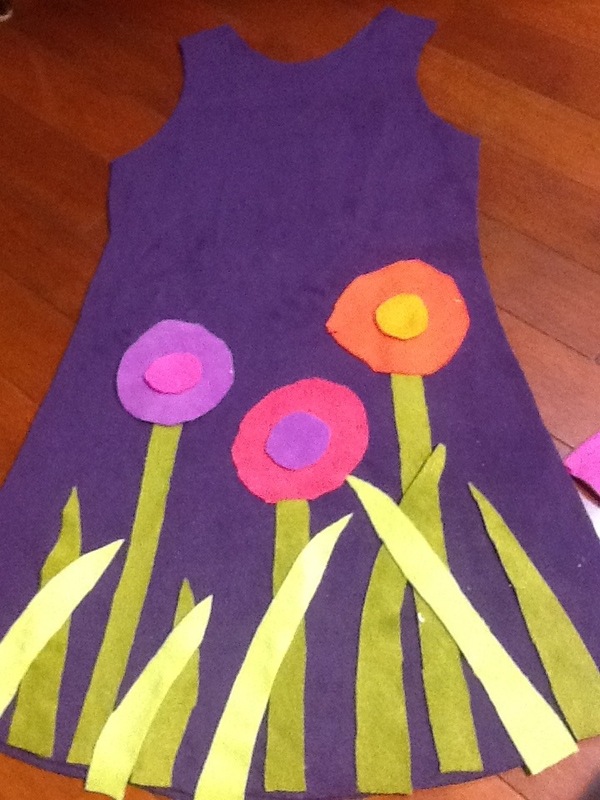 How to make a dress from a dress! So, the Markham Fair was last week…it was really fun to go there and see our artwork on display. The kids were so excited to find each of their pieces. we even won a few ribbons! 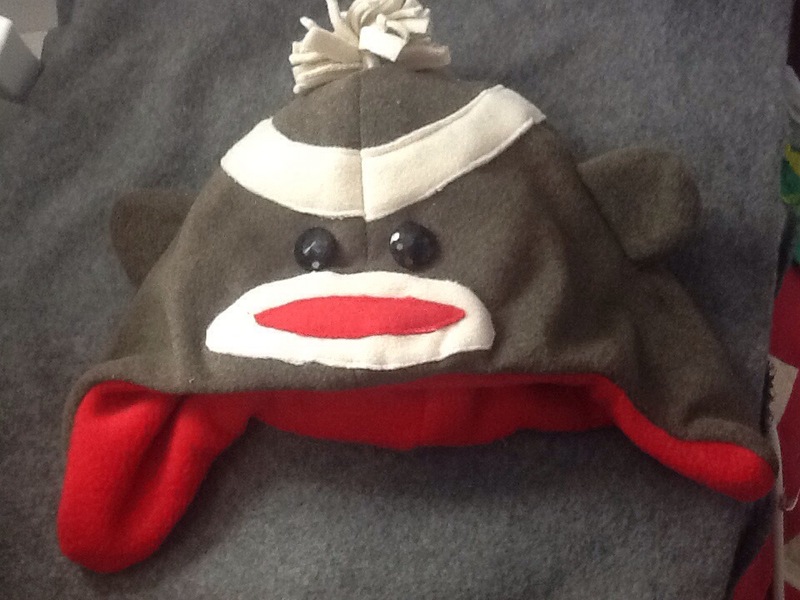 My Christmas bag I posted won first place! I think I won $5.00! 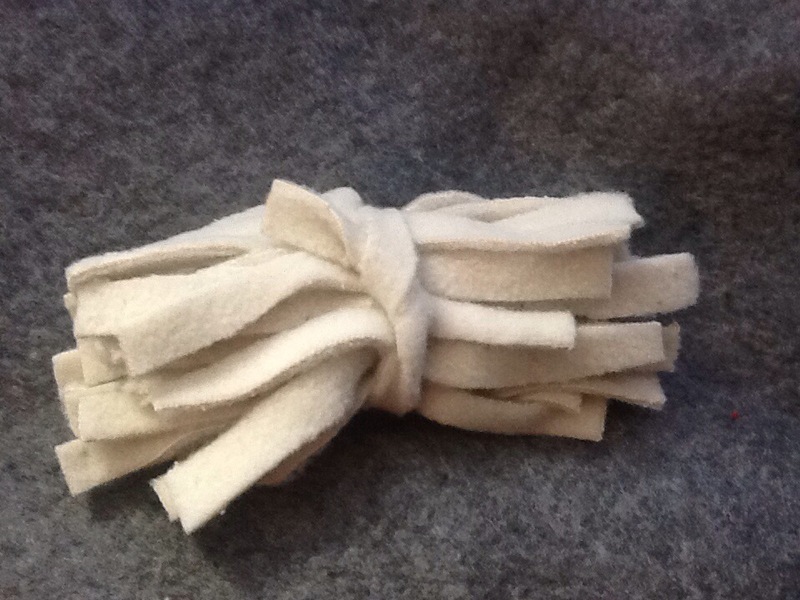 (we enter not for the financial reward, but for bragging rights) Anyways, one of the categories was to sew an article of clothing out of polar fleece. 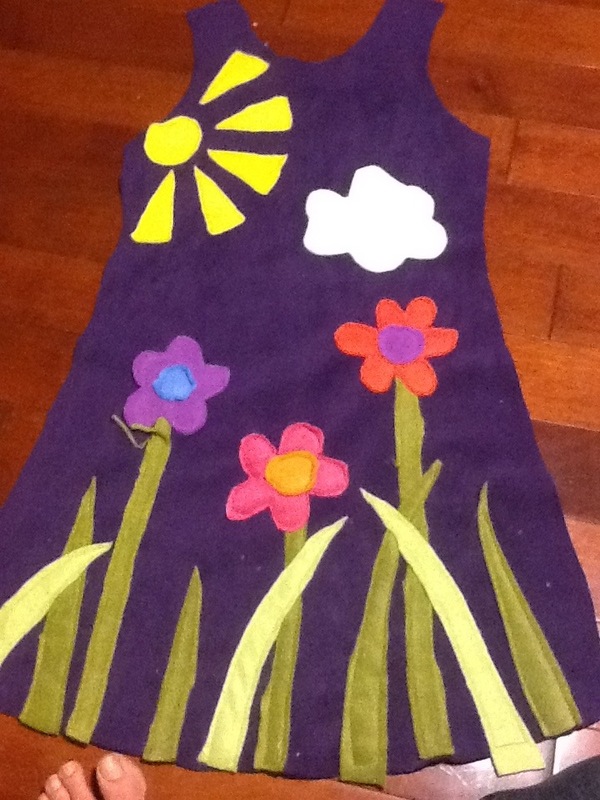 So, I decided I wanted to make Sam a polar fleece dress….with a little extra. I have to say that (I have said this many times before) I am a lazy sewer. 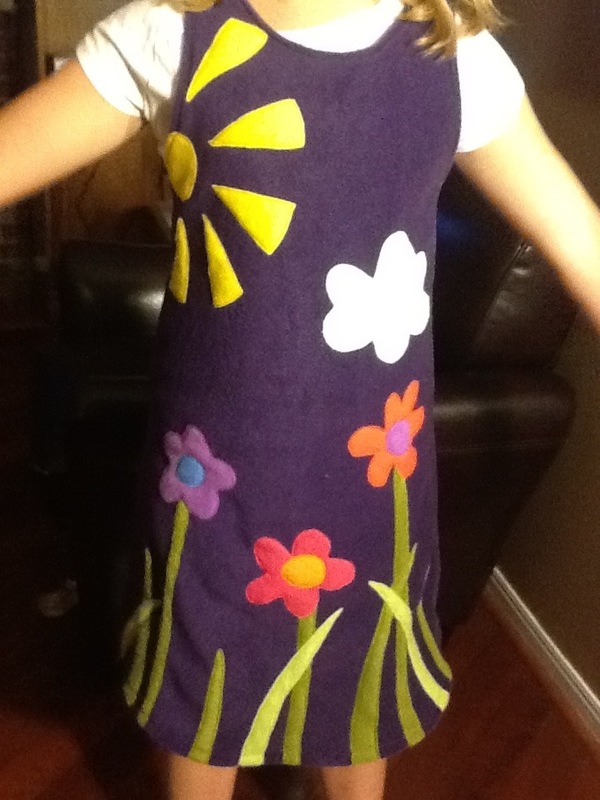 I couldn’t be bothered seeing if I could find a pattern of a girls dress, so I just found a dress that fits Sam pretty well. 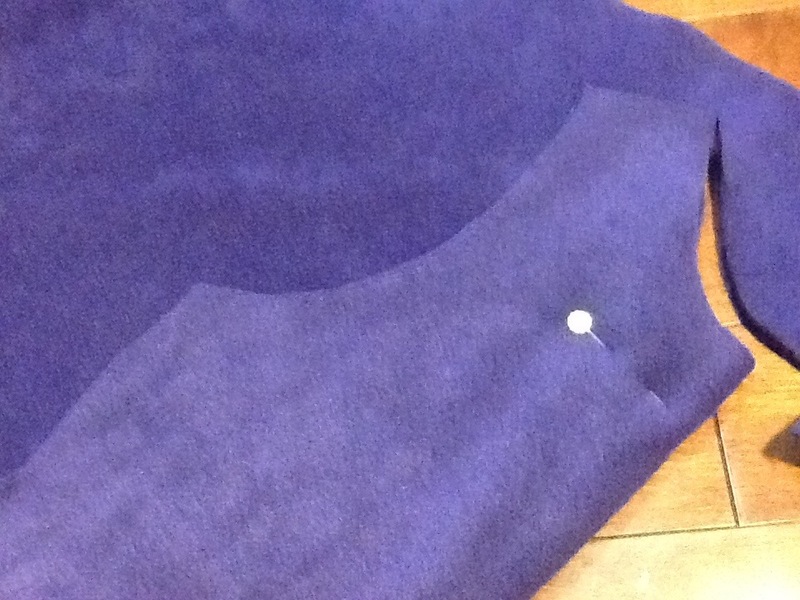 I spread out the polar fleece on the floor, and pinned the dress down, making sure it was pretty flat. 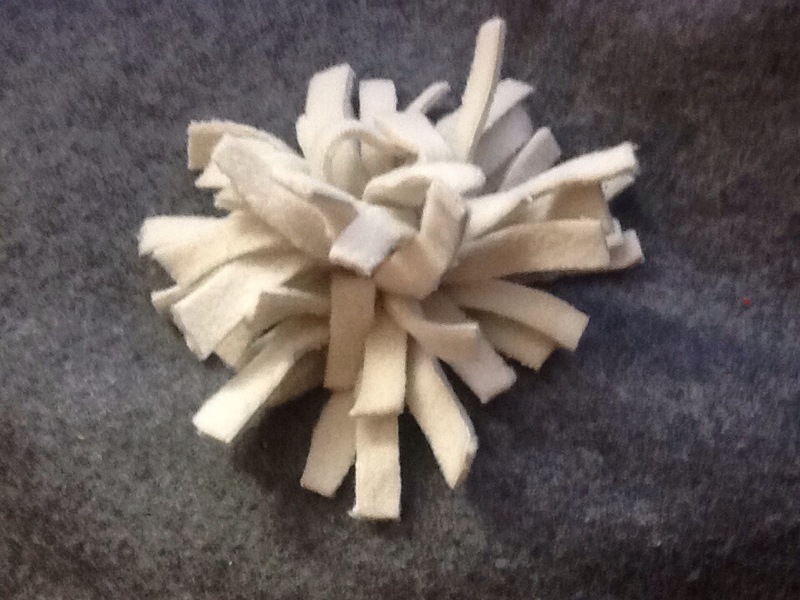 Then, I unpinned it, and folded the polar fleece in half, and pinned it. 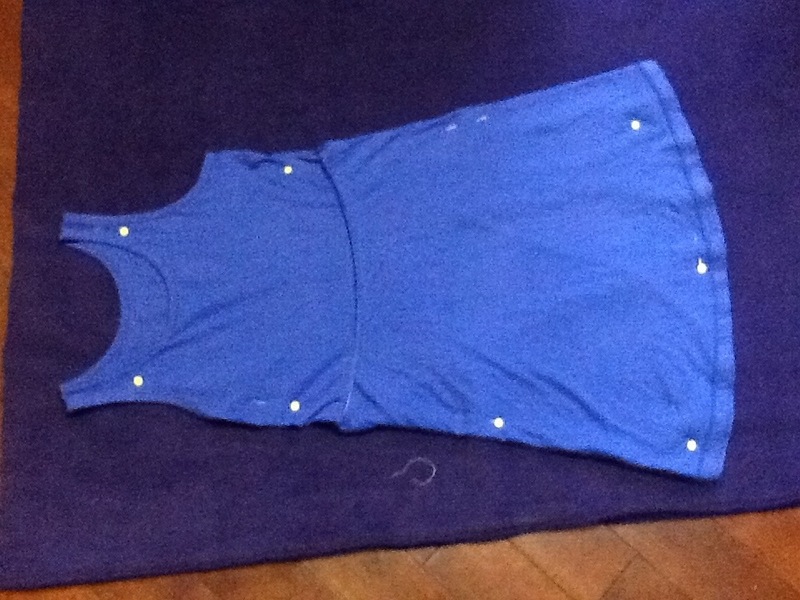 I did it this way to make sure the dress was symmetrical, and even on both sides. 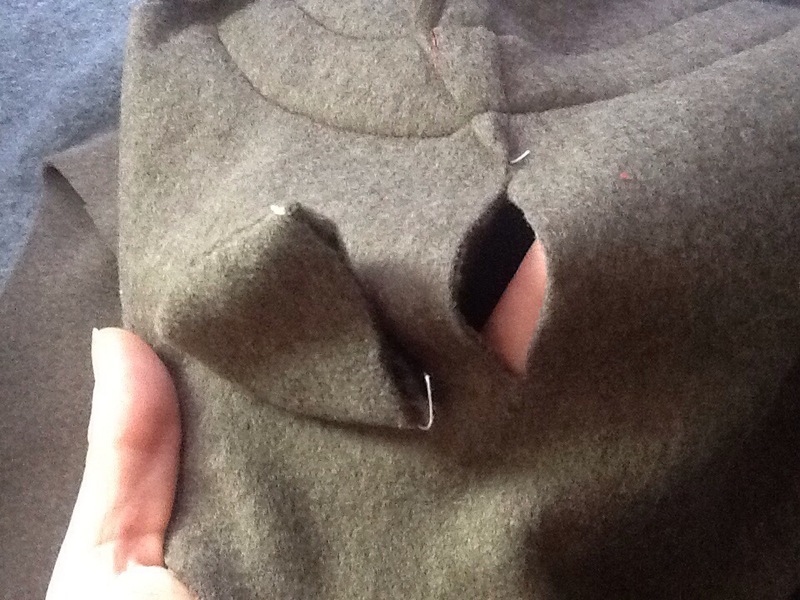 And then I cut it out. 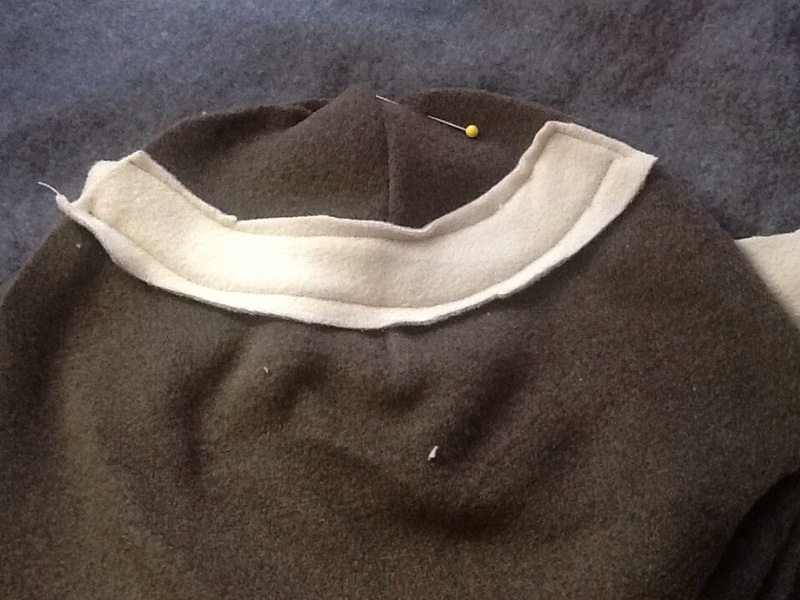 I trimmed off a little more on the neckline of the front. 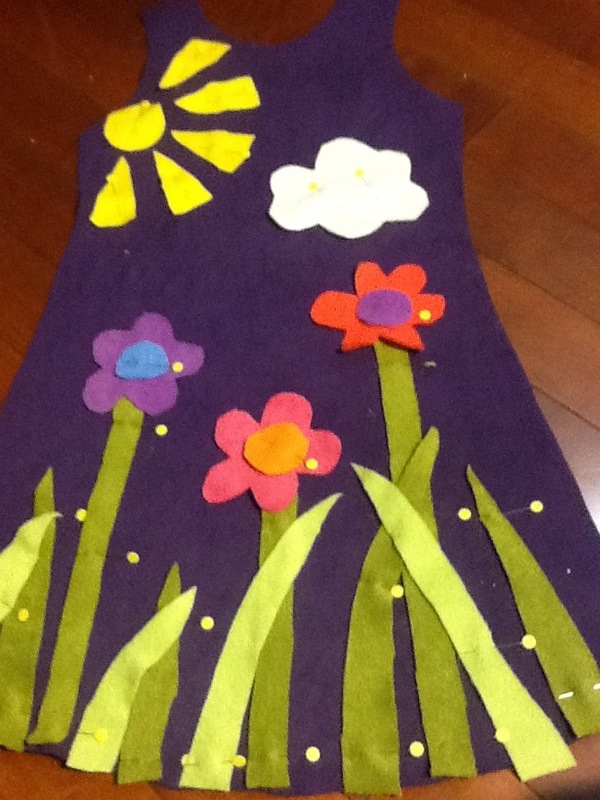 Then adding a little more…. 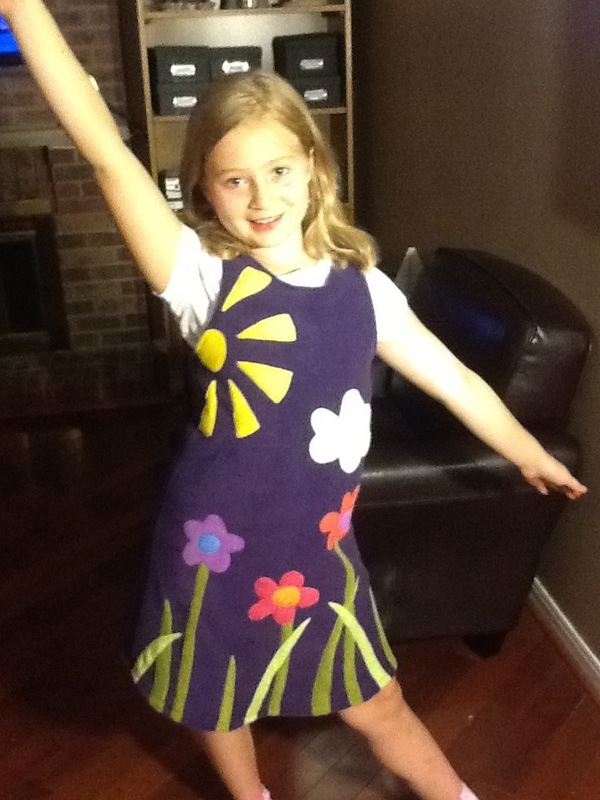 And, guess what…the dress won third place! 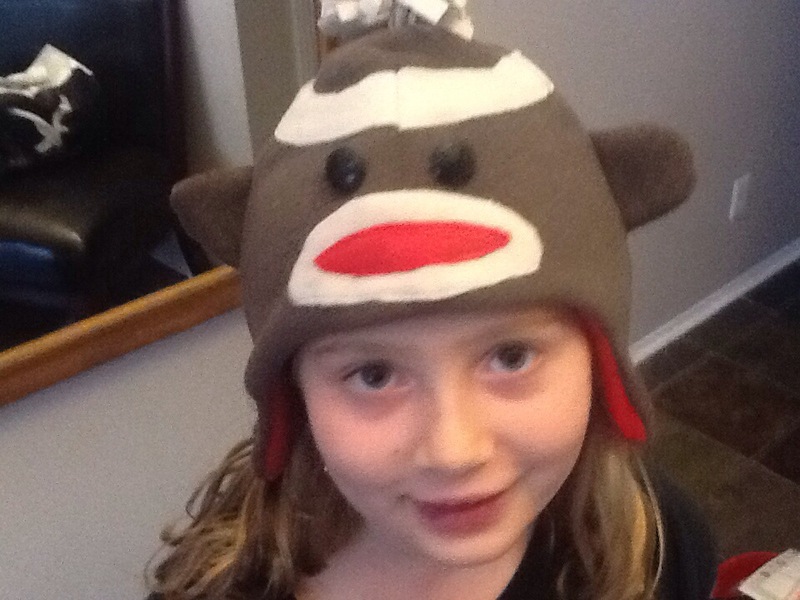 Sam will be thrilled that she can actually wear it now!